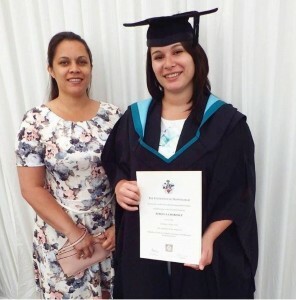 Rebecca Lawrence received her Degree of Bachelor of Veterinary Medical Sciences with Honours (First Class) on Monday 6 July 2015 in front of an assembled audience at the East Midlands Conference Centre, University of Nottingham Park Campus. Rebecca’s Degree has so far taken three years, but forms a part of her five-year veterinary qualification. In order to qualify as a Veterinary Surgeon, Rebecca needs to complete a further two years of study and clinical experience.